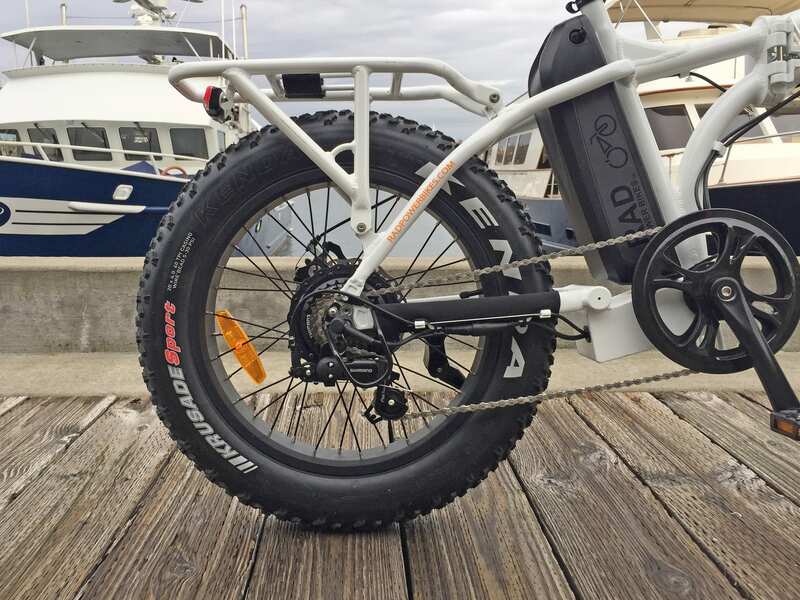 Rad Power Bikes is well known for their full sized fat tire electric bike called the RadRover. 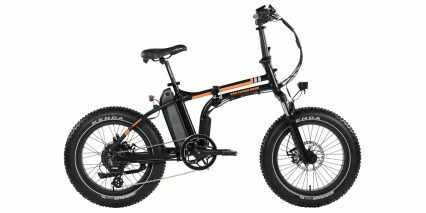 It’s comfortable, off-road capable, and priced well… but as much fun as that product is, the stand over height is ~30.5″ and even with the quick release wheels, it’s just a big bike to move and store. By contrast, the compact RadMini has a lower 27″ stand over height, can fold in half to save space, and weighs ~3 lbs less. 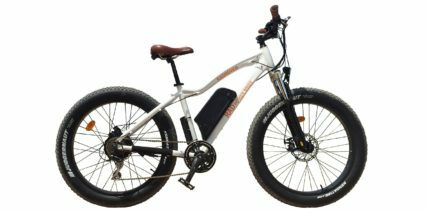 All this, and it can still support up to 275 lbs and uses the same high-capacity battery and powerful 750 watt geared hub motor. 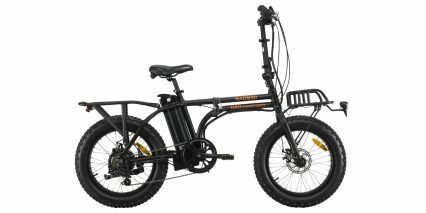 In some ways, the RadMini is more capable than the RadRover because it runs smaller 20″ x 4″ wheels which gain a mechanical advantage for the motor and 180 mm mechanical disc brakes. 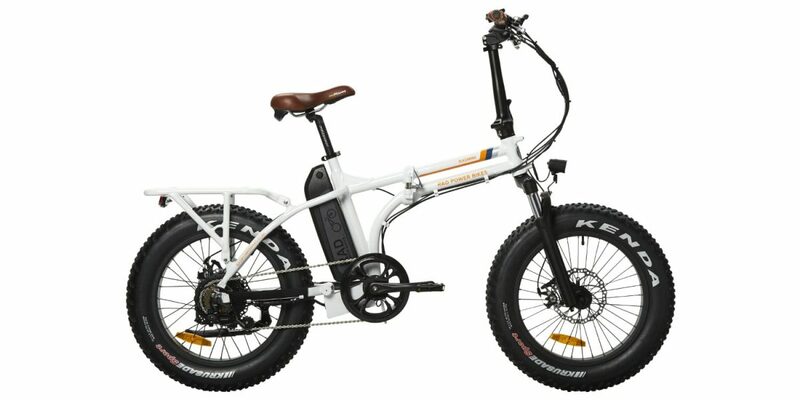 Compared to the first generation RadMini model, this latest version offers a suspension fork with lockout, hydroformed Aluminum alloy frame with reinforcement gussets to provide strength, and a higher definition 12-magnet cadence sensor compared to 6 magnets before. 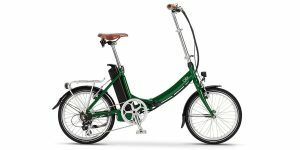 The price hasn’t changed, it’s still $1.5k, but in my opinion, the new model has a nicer paint job and the new front-rack design is much more capable and stable to ride with. 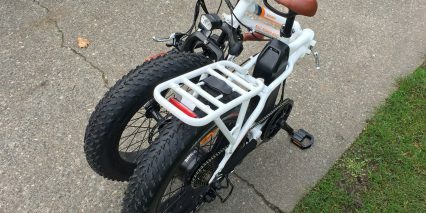 And, RPB has expanded their accessories line so you can get a suspension seat post, wide plastic fenders, pannier bags, or connect a Yepp! 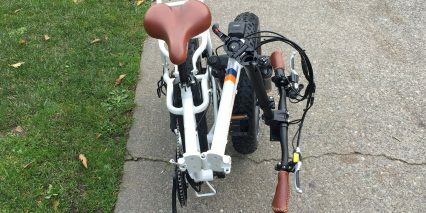 child seat directly to the included rear rack because it has the correctly sized rectangular window. 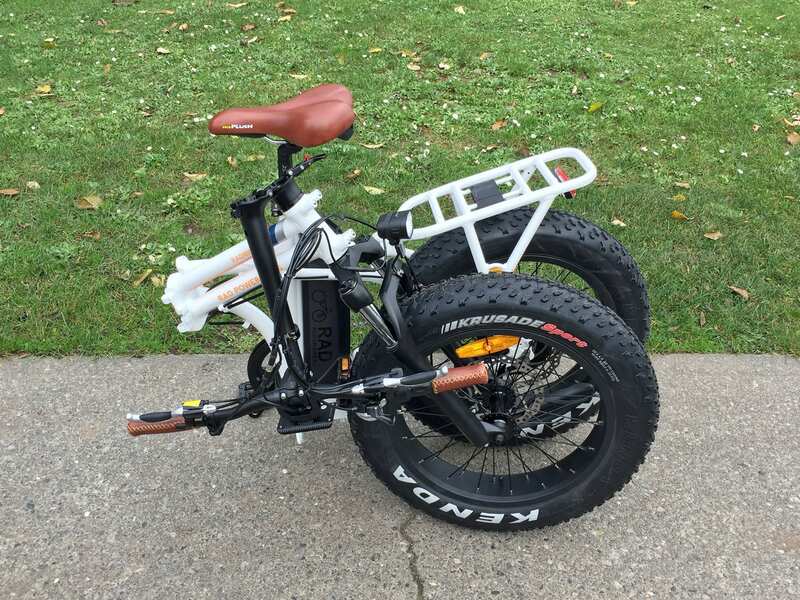 Whether you’re someone who wants the fat bike experience, which will take you through soft terrain like sand and snow, or someone who just wants a folding model that can share the same battery pack as other second generation Rad Power Bikes, or you’re a shorter rider who simply cannot approach and mount the full sized RadRover, the new RadMini has a lot to offer. Of course, it’s not perfect and some compromises had to be made in order to keep the price low, but I’ll lay those out in the paragraphs below and try to help you navigate what the compromises mean and when they are most relevant. 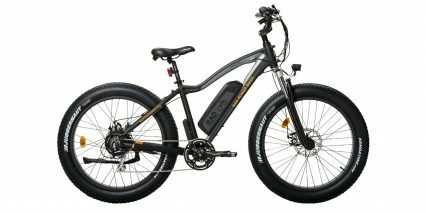 Driving this bike is a fat tire specific hub motor from Bafang. The wider casing on this motor provides a sturdier bracing angle for the thick 12-gauge spokes while permitting wider staters and magnets inside, to provide more power. 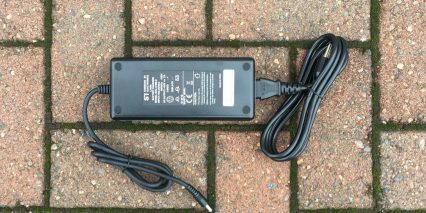 It’s rated at 750 watts, which is the absolute maximum that’s legal in the United States, and is specced down to 500 watts for Canada to comply with local regulations. 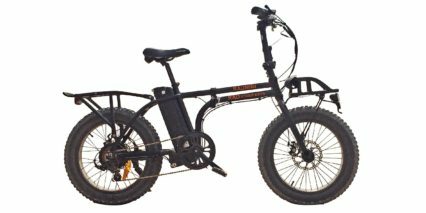 This motor is relatively lightweight at 13 lbs (compared to the 15 pound gearless motors on the RadWagon and RadCity models) and it’s compact, nearly hidden between the 7-sprocket cassette and 180 mm disc brake rotor. 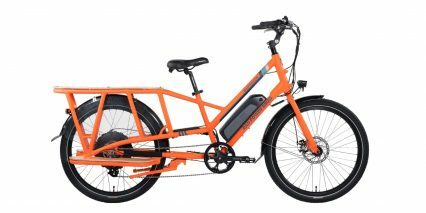 The pedaling drivetrain on this bike is the most basic of all Rad Power Bikes, using an entry-level Shimano Tourney derailleur, but it definitely gets the job done and feels natural from zero to 20+ mph, which is the top assisted speed. In order to make pedaling feel right, given the smaller wheels, a large 48 tooth chainring and standard 170 mm crank arms were chosen. 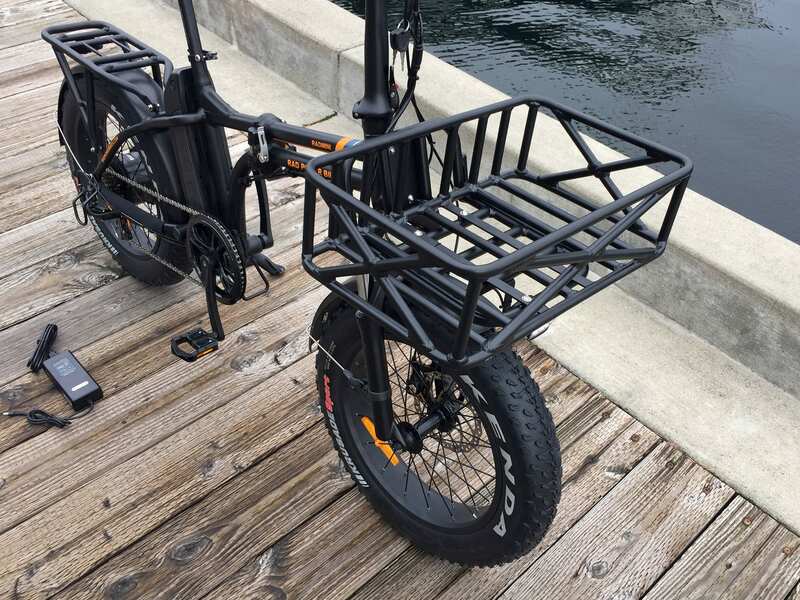 Compared to regular folding models, which also use 20″ wheels but narrower 1.5″ to 2.25″ tires, this bike is higher up and feels more like a full sized bicycle. 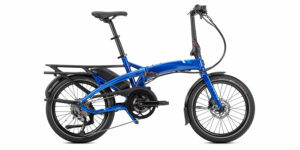 It’s definitely more stable and comfortable than a lot of folding bikes and I love that it offers both pedal assist and throttle mode. Starting from standstill can be difficult in soft terrain, so being able to use the motor to help you generate some speed and stability before picking your feet up to pedal is perfect. I used the throttle extensively a couple of years back when test riding the Gen 1 RadMini in Cabo San Lucas, Mexico. 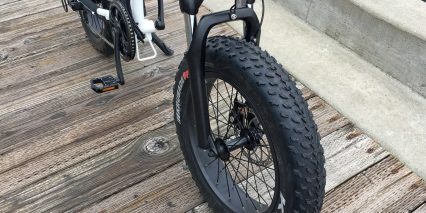 It was incredible to actually see these things (the full sized RadRover and compact RadMini) plowing through soft sand… they key is to lower the air pressure to 5-10 PSI. Back on paved sections or hard packed Earth, the 20 to 30 PSI range is more efficient. I love how responsive the new 12-magnet cadence sensor is and that you can arrow down to zero for throttle only mode or press the throttle toggle button to completely disable it. 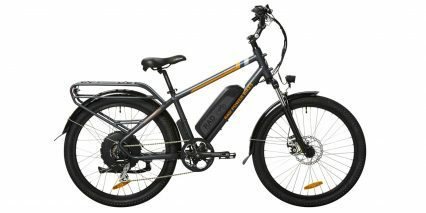 You get full control of how the motor performs on this electric bike. Yes, geared motors produce a bit more noise and the power cable leading to this motor is a bit exposed on the right side of the rear axle, but Rad has included a Steel derailleur guard to reduce bumps and snags… an excellent decision given that this bike folds and could end up getting jostled around. 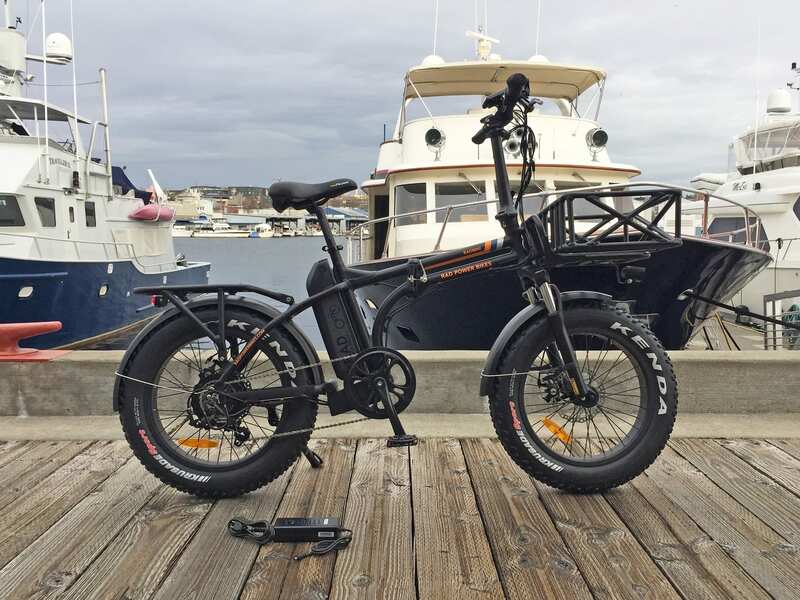 Compared to the first generation of Rad Power Bikes, the new battery pack offers ~20% higher capacity and only weighs 0.5 lbs more! So, hopefully you won’t run out of juice on longer or more adventurous and strenuous paths. 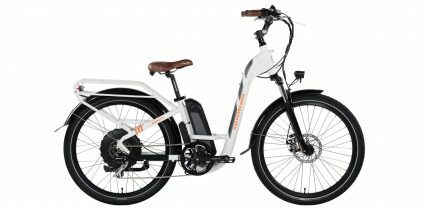 The new pack is slimmer, mounts to the frame on a track that bolts down in three places for added strength, and can still be charged on or off the frame (making it convenient for commuting and easier to care for in extreme hot or cold weather). 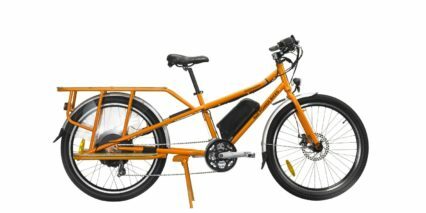 Considering just how large and heavy the RadMini is, despite looking compact, I could see myself storing the bike outside or in a shed and then bringing the battery into a more neutral, dry location for safe keeping. If you know it’s very cold out, keep the battery warm before taking a ride because otherwise the cells won’t last as long. This is especially relevant on those days when you’re planning to ride the Rad Mini in slow! If you plan to store the pack for more than a month without using it, I have heard that keeping it around 50% vs. completely full can be easier on the Lithium-ion cells. The actual cells inside are Samsung 18650 size 35E high energy density. 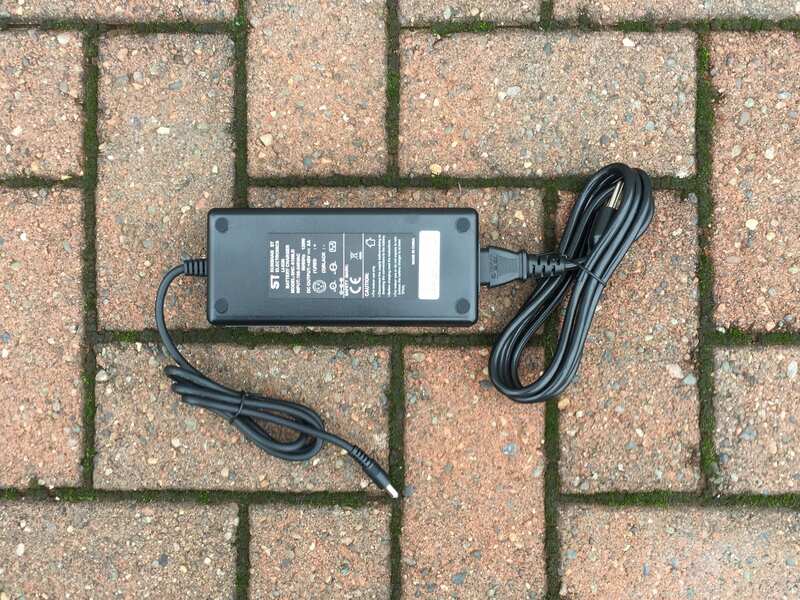 It impressed me to discover that this 48 volt 14 amp hour pack can be replaced for just $499, and I think that’s partially because the controller unit is made separate. This is one area where the RadMini looks a bit different than the other models which have a plastic controller box mounted to the seat tube. Instead, the RadMini has a controller box situated just below the bottom bracket, and I love that there’s also a metal support arm here that protects it and the chainring from damage. I was told that the independent controller reduces complexity, heat transfer to the battery, and makes fixes easier… but it doesn’t look quite as good as if they were all combined in my opinion. 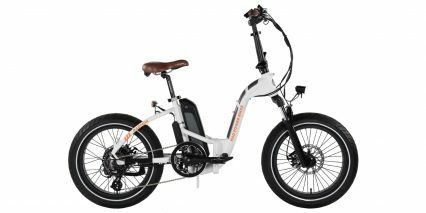 Even though the RadMini is a purpose-built electric bicycle, the battery and controller box are still external… and it’s not as efficient or effective at climbing as some of the new mid-drives, or as balanced. 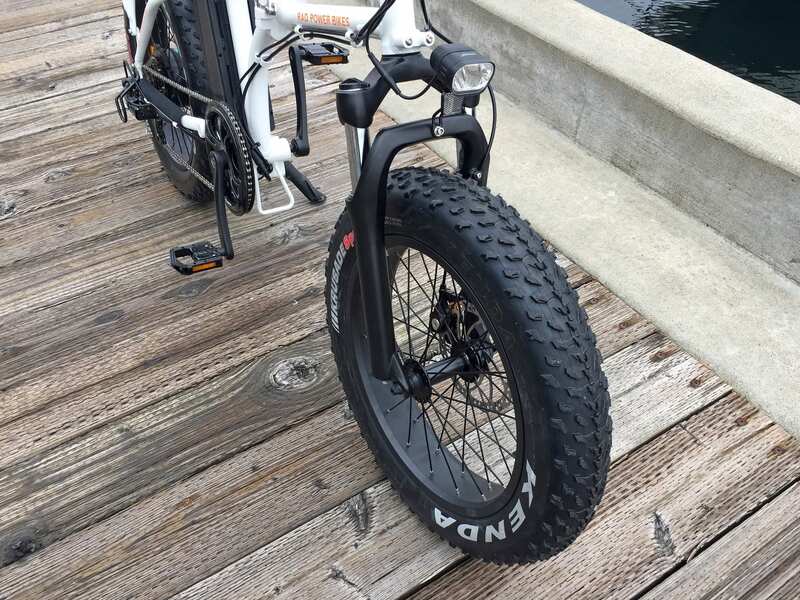 That said, I haven’t seen any mid-motor folding fatbikes yet. 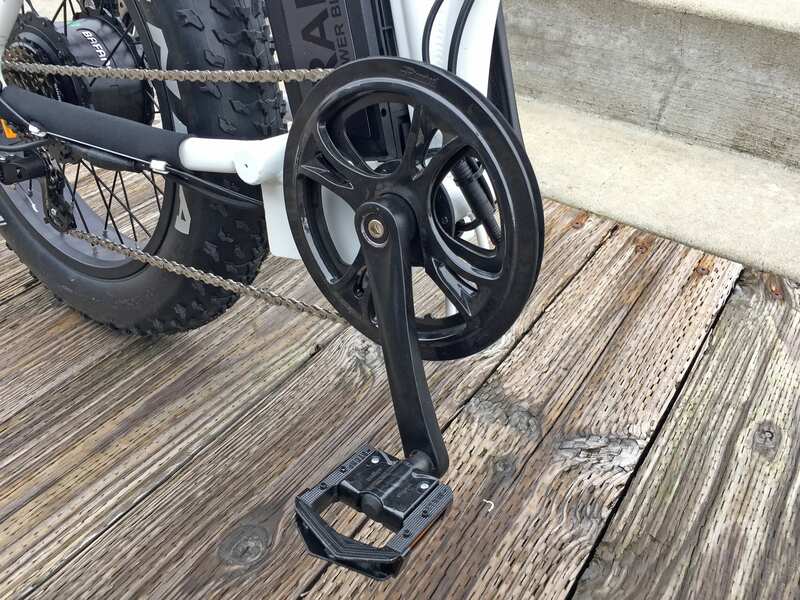 All things considered, I feel that weight is still distributed well on this frame, and I love that little things like the neoprene slap guard, plastic guide that will reduce chain drops, and large and sturdy folding pedals vs. the narrow flexy plastic ones on most other ebikes. 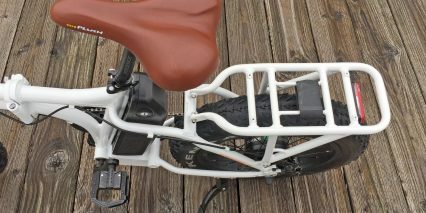 Operating the bike is relatively simple but improved from earlier designs because of the new battery. Before, once you had charged the pack, you would press a silver circle button to activate the battery… and anyone could do this, even when the bike was parked at a rack. 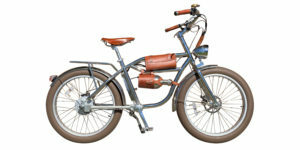 Because the RadMini has a throttle that can be used at standstill, people could then tamper with the display and motor even when the bike was locked (if you left the battery on the bike). The new battery solves this, and prevents accidental drops, by requiring you to lock the battery to the frame in an off or on mode. So now, you cannot start riding until the pack is locked in place and people cannot tamper with it if you locked it in the off position! To activate the display, just hold the Mode button in the middle of the rubberized control pad (near the left grip) and it blinks to life. This display is not removable, but it does swivel forward and back just enough to reduce glare. It’s large, which makes it easy to read from a distance, and it shows your battery level, trip stats, speed, and assist level 0-5. 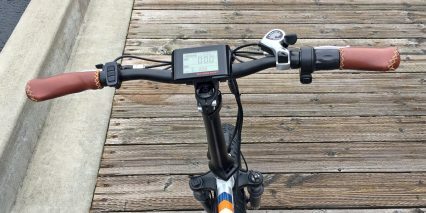 If you press the mode button, it cycles from trip distance to total distance (odometer), and if you hold the up arrow it will cycle from current speed to average speed and max speed. 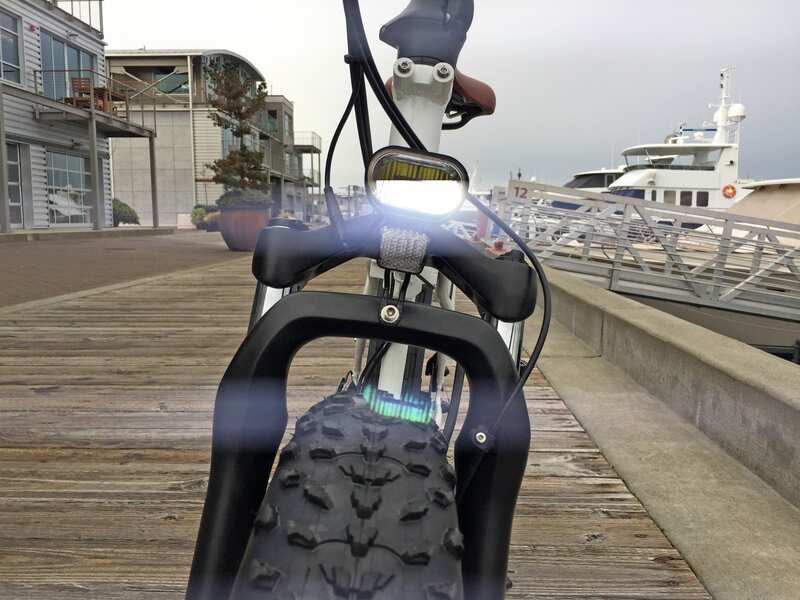 For those who want to mess around with settings, hold the up and down arrow keys simultaneously, and for those dark riding moments (or to be extra safe during the daytime) just hold up and mode simultaneously to activate the headlight. The final tip I have is that you can hold the down arrow while the bike is in assist levels 1-5 to activate walk mode, which can be very handy if you have to walk a difficult section of trail, cross a non-bikeable area with a loaded rack, or get a flat tire. I love that in addition to the range of power levels that you can ride with, the throttle offers full power at all times. This is nice for saving energy but still having access to quick bursts of power for climbing or catching up to friends. And, the throttle can be completely shut off if you want, just press the black toggle button near the right grip. 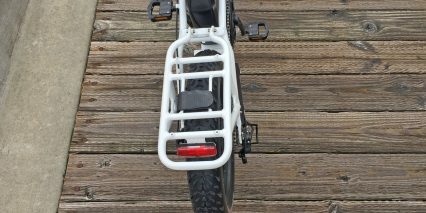 This is very useful when mounting the bike, walking it, or picking it up. Of course, I recommend always disabling the bike completely by turning it off to be extra safe when handling. 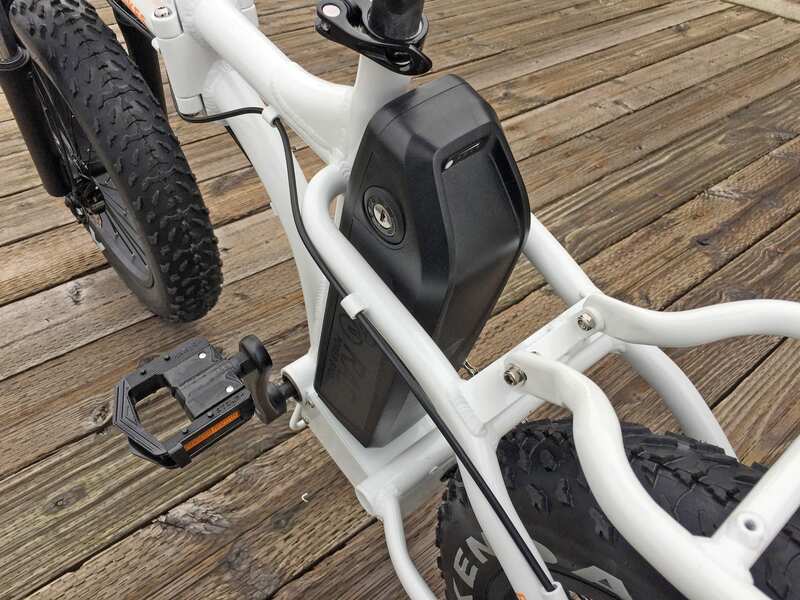 I should also mention that the charger for all Rad Power Bikes is just 1.1 lbs and offers a standard 2 Amps output for ~6 hour charging from empty. It’s not the fanciest thing in the world but it gets the job done without being too bulky and I like that the charging port on the battery is positioned out of the way of the crank arms so it won’t get snagged or bent as easily. Earlier in this review, I did mention that there were some trade-offs to consider with the RadMini, compromises that were made to keep it affordable. One of the biggest to me, is the use of mechanical brakes vs. hydraulic which are easier to pull and usually have adjustable-reach levers to fit smaller hands. 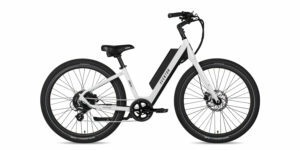 Mechanical brakes are easier to adjust post-purchase, and the big rotors do a great job actually stopping this bike, but that’s to be expected considering that it’s heavier and larger than a lot of other e-bike models. Buying from a direct seller like Rad Power Bikes means that you may not get to test ride before making a purchase decision and you will also have to spend some extra time and energy unpacking and tuning the bike… However, RPB does offer a solid one year comprehensive warranty, the company has been growing fast and has a lot of bikes out there in the real world (so maybe you could see or test ride one in the wild), and now they have partnered with Velofix to assemble, deliver, fit, and give a 30 day tuneup post-purchase for just $100. It’s a neat approach, one that continues to keep the price low while upping the convenience factor. A few little delighters for me are the integrated USB charging port on the display, the stainless steel torque arm on the rear dropout, the flashing mode on the rear light (even though it’s not wired in like the headlight, and is easier to forget to turn on/off), and the narrow double-step folding joint at the middle of the frame. 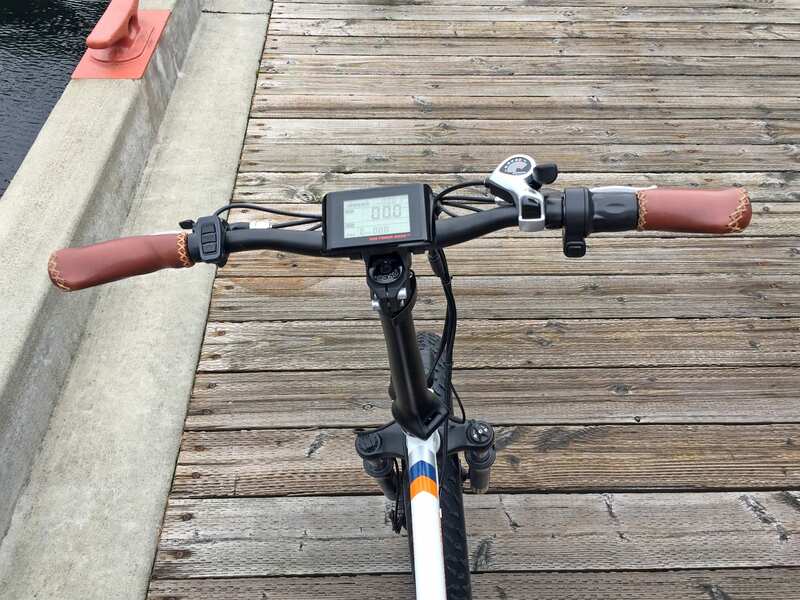 The handlebar and seat height can be raised or lowered slightly to improve fit, but take care not to go too high or the cables and wires at the front can get pulled (or even interfere with the front rack option). 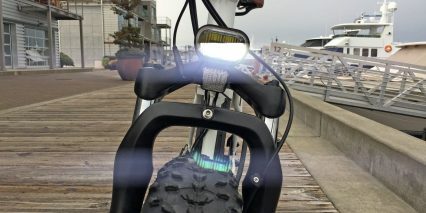 Note that the headlight has been upgraded from Gen 1 and is brighter and nicer overall, but it’s going to bounce up and down a bit because they positioned it on the suspension arch vs. the head tube or handlebars, and if you get the optional front rack and basket, the light gets repositioned onto the bottom and will not turn as you steer the bike. I like that they chose black spokes, to match the hub motor and black rims, but they did not use punched out rims which would reduce weight and allow for liner flex and improved comfort when riding. The seat has a handle built in, which is handy for lifting and repositioning the bike, but it could become a point of vulnerability if you opt for the suspension seat post (which is more fragile than the rigid alloy post). 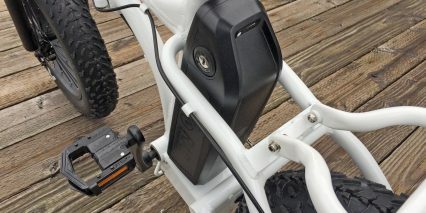 The new battery design is easier to mount and dismount than the older one, and lighter because it’s plastic vs. aluminum, and it seems like you can actually take the battery off without removing the seat like you did before. 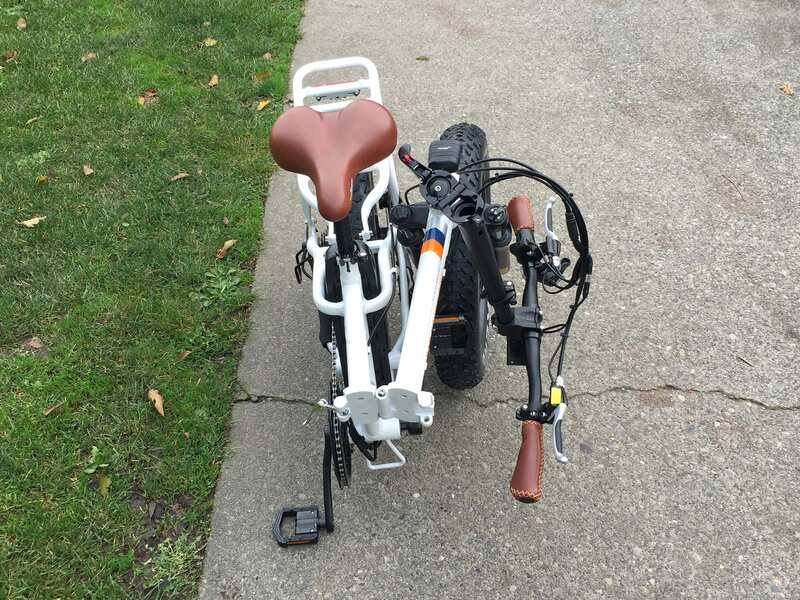 Finally, the kickstand is positioned perfectly so that it supports the rear rack when loaded and stays out of the way of your left crank arm. 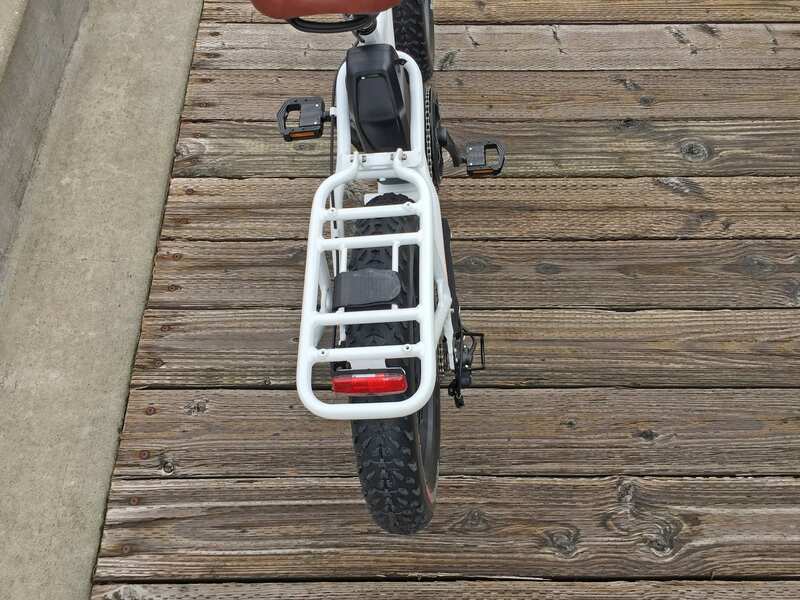 It offers adjustable length and a wider base so it won’t let the bike tip too far or sink in to soft terrain like sand/snow as easily. 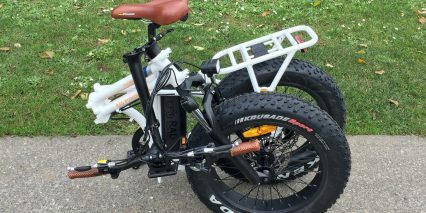 I hope this in-depth review helps you to compare and contrast some of the different Rad Power Bike models and I’d like to thank the company for partnering with me on this post, providing both colors, and many accessories to showcase during the review. Feel free to post your questions and comments below or in the EBR Forums for input from people who might have owned the first generation. 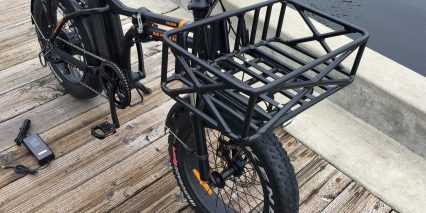 The rear rack is bolt-on but I like that they color matched it and that it stays out of the way so you can really lower the saddle height if you want and still have a trunk bag! 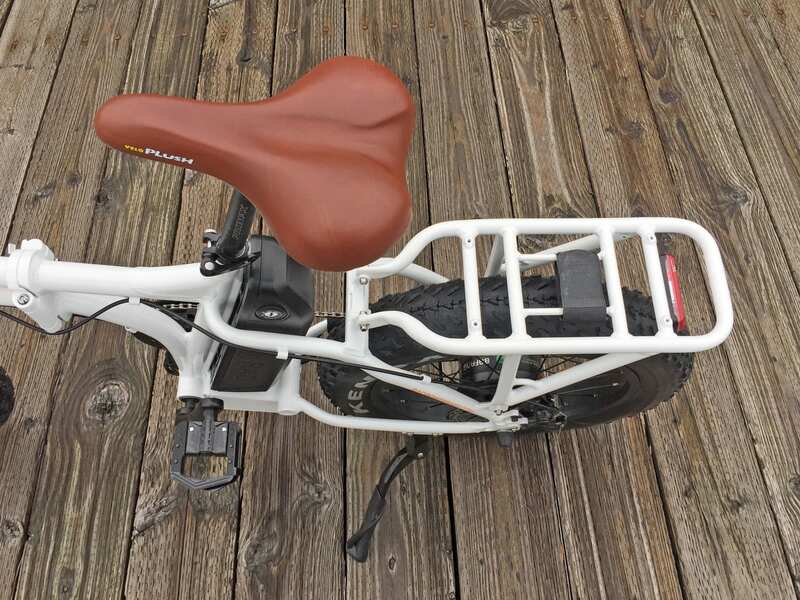 Some folding bikes skip the bungee cord, magnet, or a Velcro strap to keep them from coming unfolded but the RadMini does not, it comes with a Velcro strap! 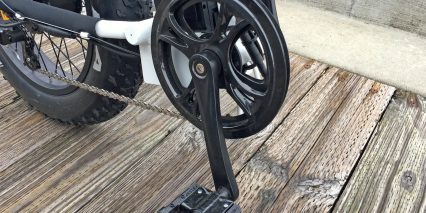 But you could still use your own bungee cords or get an adjustable one like this to keep the frame extra secure when transporting in a car, boat, plane, RV, etc. Court, thank you for another great review! 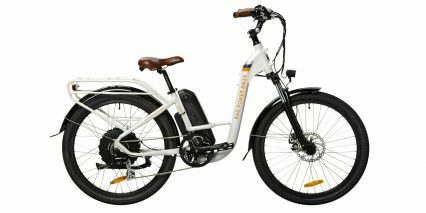 The 2018 model of the RadMini makes it an even more desirable bike, specially with the addition of the suspension fork and the optional suspension seat post. 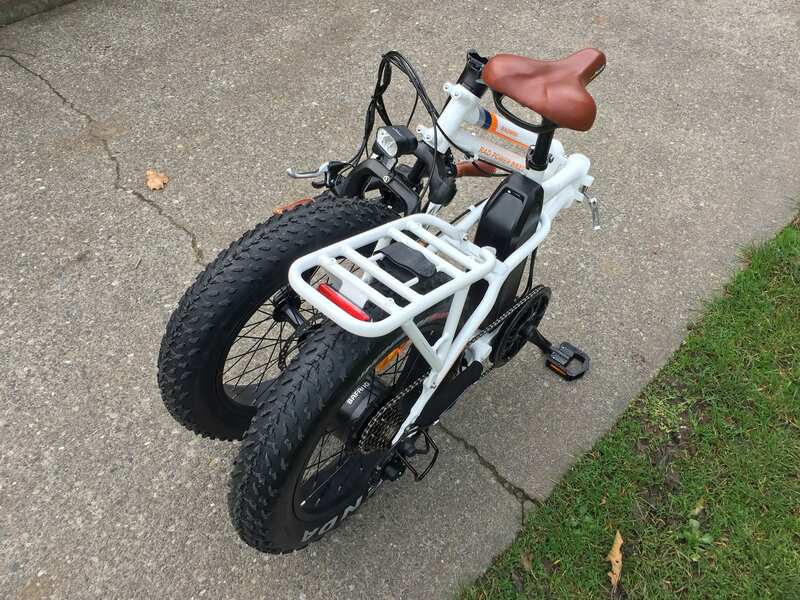 The rear rack and the optional front rack(s) make it into a mini-cargo bike with fat tires. 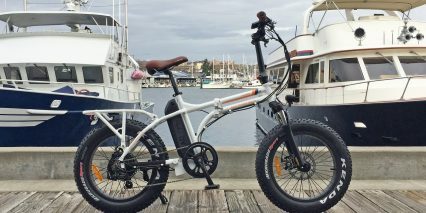 A go-anywhere expedition bike! 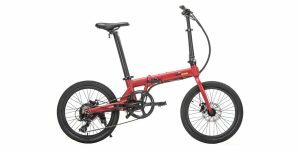 If I remember correctly, in your review of the original RadMini you mentioned a bit of frame flex due to the hinge that allows the bike to fold. Perhaps I missed it, but has this issue been resolved to the point where there is no frame flex anymore? 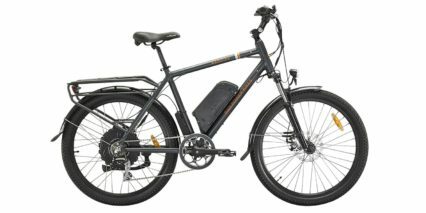 Hi Court, a couple of weeks ago I decided I wanted an electric bike. I saw the Sondor, but eliminated it after a couple of reviews comparing it to others. Then I found your site. I finally decided on a Radmini. I’m only going to use it on city streets and paved bike trails. No sand, no forests, no trails. But I think it will do okay. Your views are all great and I’ve started playing them for other people. But I miss that you do not do comparisons. 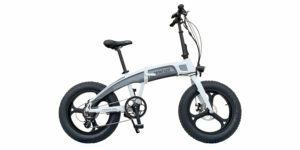 For instance, I would like for you to do a comparison of some of the folding bikes. 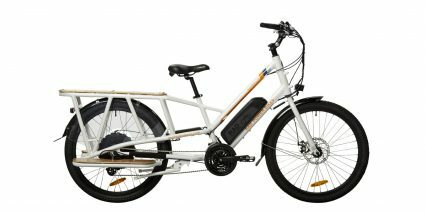 This one is better for off-road, this one is better for Beach, this one is for people who only ride on city streets and paved bike trails. That would have helped me immensely. But I think I’ll probably enjoy the Radmini anyway. Thanks again for your reviews. Hi Don! I think the RadMini will work very well for you, even on concrete ;) their folding bike is unique in that it could also handle some sand or snow… but the only downside is a bit of drag, extra noise from the tires, and increased comfort! I really appreciate your thoughts about how I could suggest what each model is good for, I’ll take that into account for future reviews and again, thanks for spending some time to share your thoughts here! 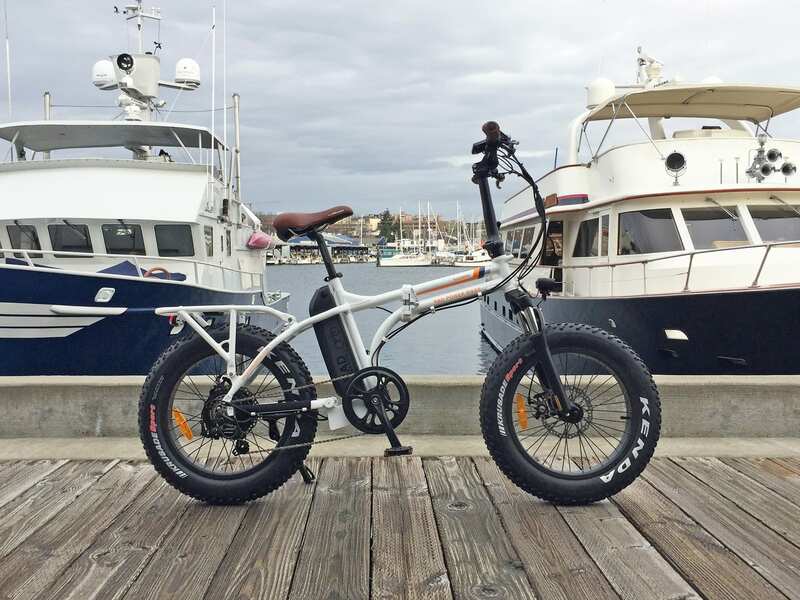 Feel free to post updates as you ride the RadMini here or in the Rad Forums. Love your reviews, but still wondering about the Rad mini vs. the Rad Rover. 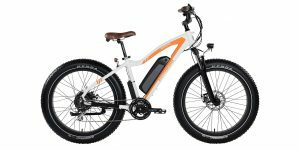 They both seem excellent but I wondering how the basic ride comparison is on road and on trails. The Mini seemes like it might preform with more agility off road, traction, turning etc… I have loved my full size/full suspension mtn. bike and wonder if I would miss the full size feel with the Mini, but I am naturally attracted to it. 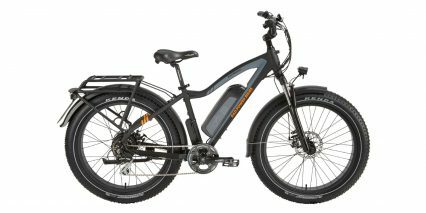 Any pertinent info/ideas on the feel of riding both on and off road for a 5′ 10′ 150 lb. 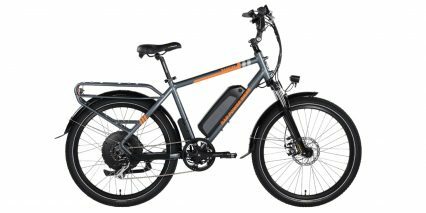 male on both bikes ? I have a Rad Mini. When comparing with the Rover, the riding positions are totally different. The Mini is an upright position. It takes a little getting used to especially off pavement. I agree that the Mini is more upright, especially compared to the 2017 Rover. For 2018, they shortened the stem and added mid-rise bars for the RadRover so it’s also more upright and comfortable (you can still tip the bar forward if you want to be aggressive and sporty). Which model years do you have mike? I can’t see the comment you made about mid drive bikes the new mid-drive bikes but can you elaborate a little bit more on that and tell me some brands that have more efficient and better hillclimbing capability and some prices compared to rad mini. Just a second thought In the videos I always thought you liked the rad mini more than the rad Rover. The reason I say that is you always look like you’re having so much fun talking about it and riding it and have so many good things to say about it. 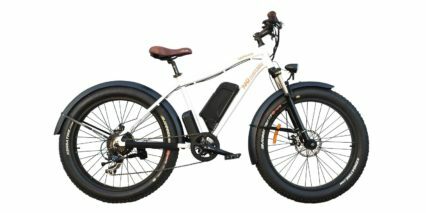 What are the dimensions of the 2018 Rad Power battery pack? I can’t find that information anywhere and it would be nice to know when grabbing a battery and stowing it in a bag. Thanks!! Hi Goat! Scott from RPB here, when the battery is set flat on a table it measures out to be: 14.75″ long, 3.75″ tall, and 3.5″ wide. 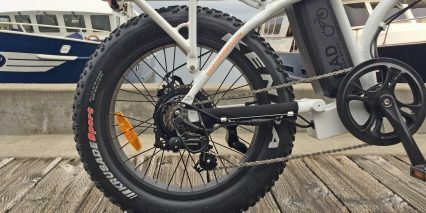 We purchased two Radmini’s and rode them for 20+ miles the first day and after riding a few miles, we had heard a strange noise on my husband’s bike coming from the rear tire motor, on a low load and continued to get worse. So after we got home I sent Tech. Service an email as they were not open for business yet. I thought before I called I would make a short video as it states in the warranty section of they’re website. I had heard they’re customer service was great, and let me tell you they are PHENOMENAL!!! They emailed me and I sent the video and shortly after I had a tracking number for a new rear wheel with the motor system coming to us! Wow this is the best company to deal with! All in all Rad Power Bikes has amazing bikes and outstanding tech support specialist (Thanks Jules!) and if there was a star system, it definitely would be off the charts!! If your on the fence about buying one… get off it and do it! No regrets, this is the most fun I’ve ever had riding a bike!! 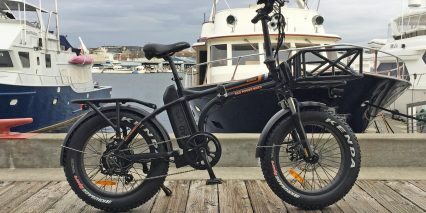 I’m most likely going to purchase the RadMini once they come back in stock, for use in and around Duluth, MN which is on the nose of Lake Superior. I’m excited to use it on Minnesota Point which is all sand, on our Lakewalk in winter and some of our mountain biking trails around the city. 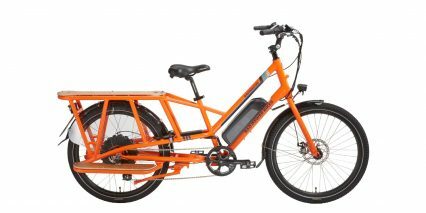 I recently moved to a particularly steep part of our very hilly city, and I’m wondering if you think this bike will be able get up the hills? Our steepest hills range from 20–25% grade. BTW I love your reviews—I’ve watched a ton of them now. Extremely helpful! Two things come to mind… the RadMini motor gets a mechanical advantage because it’s a geared hub motor that is spoked into a smaller wheel. 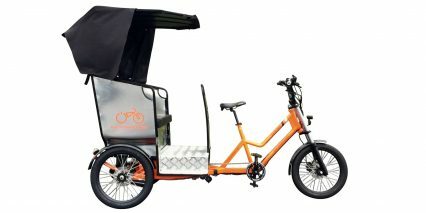 I think it would do fairly well up hills, as long as you get some momentum going in or switch to a lower pedaling gear and help out. Performance definitely depends on the weight being transported, the tire pressure of the wheels, how full the battery is, and whether it’s windy outside… but the big factor is if you can gather some speed to get the motor started or help just a little with some pedaling. Hey I just got this bike. After paying my local bike shop to assemble, inspect and “tune” up breaks and tire pressure, etc. I tested it for 2 weeks, rides nice! But the biggest disappointment is the range!! Riding on mostly flat roads with a little climb here and there, I only got about 13 miles of 25% pedal assist level 2/3 and 75% FULL ELECTRIC throttle. Rider weight is 175lbs. Is this normal? I can’t imagine this thing going up to 42 miles even on lowest pedal assist. Hmm, thanks for the feedback Peter! I haven’t been able to test most of the bikes for range… and it’s such a subjective factor. It’s nice to have your weight and use feedback here to help others.